George Washington. King Arthur. Empress Wu. 14 centuries. On one battlefield. Watch as the alliance attacks the throne. Starring Aaron Eckhart, Jeffrey Dean Morgan and Fan Bingbing. Pioneering Menlo Park video gaming company Top Games US, Inc. is using the Big Game to reintroduce its popular mobile game, Evony: The King’s Return, via a 30-second spot from Butler, Shine, Stern & Partners. In the multimillion-dollar production, “The Battle of Evony,” we witness wide-ranging battlefields that unite historic leaders across time and geography. We see George Washington, played by Aaron Eckhart (Sully, The Dark Knight), King Arthur played by Jeffrey Dean Morgan (The Walking Dead, Texas Rising, Watchmen) and Empress Wu Zetian, played by Fan Bingbing (I Am Not Madam Bovary, X-Men: Days of Future Past), become unlikely allies. 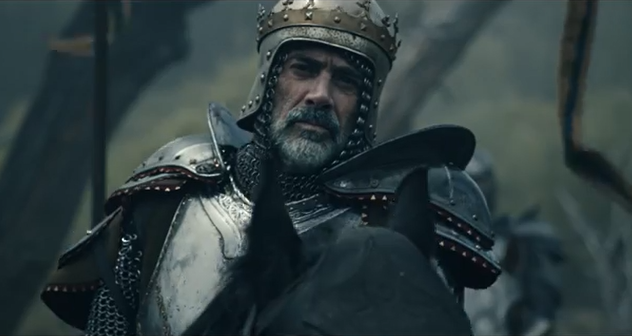 The ad campaign is introduced via a two-minute cinematic film (above) depicting our heroes’ path and their unlikely encounter in the battlefield. The culminating battle is featured in a 30-second ad that will be seen during the third quarter of the Super Bowl on Sunday (below), February 5th. There are 11 additional ads that will air later in the year, where the story line expands, and alliances are forged and broken. BSSP was selected to develop the advertising for Evony following a review. The agency has a track record of creating memorable and highly rated Super Bowl ads for such brands as MINI, T-Mobile and others. “Evony is a strategy game with depth – that goes beyond pure action. We wanted to echo that with an episodic series of spots that create a rich world of characters and backstory,” said Mark Krajan, creative director at BSSP.